Moist shaded ground. Along streams, ditches. In ditches with Asclepias incarnata, Boehmeria cylindrica, Carex lupulina, Cicuta maculata, Leersia oryzoides, Lobelia siphilitica, Mimulus ringens, Penthorum sedoides, Polygonum hydropiperoides, Ranunculus pensylvanicus, Sium suave, Verbena hastata. In shallow water in shaded ground with Bidens discoidea, Iris virginica, Peltandra virginica, Rosa palustris, Saururus cernuus. Herbaceous perennial to 4' high. Basal leaves to 3.5" long, lanceolate to elliptic or ovate, light green; stem leaves alternate, decreasing in size up the stem, sessile, reduced to bracts under the flowers. Flowers; corollas bright red, 5-lobed, 3cm or more long; calyx not auriculate at the base; stamens 5. Fruit a capsule containing many tiny seeds. Flowers late July to early October. 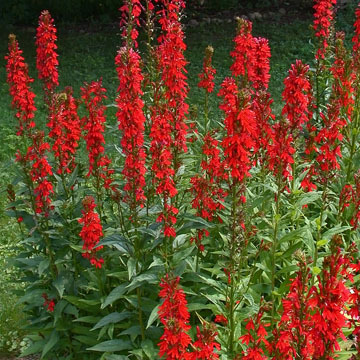 The brilliant red flowers attract hummingbirds. An easy plant to grow in moist ground in part shade. Often short-lived but will reseed in a suitable location.